The recent increase in adware releases is no surprise to us at Pcthreat.com. Our malware analysts really have their work cut out for them with so many malicious applications pilling up, waiting to be analyzed. Happy Cloud is one of those applications that has been waiting for its turn. This troublesome application falls into the category of adware and should be removed at a moment’s notice. Happy Cloud’s sole objective is to display commercial third-party advertisements while you browse the web. Our researchers warn that this program cannot be trusted, because the ads are bound to be misleading and can jeopardize your computer’s security. So, if you want to know more about this seemingly harmless program, please continue reading. Let us start analyzing this pesky piece of software by taking a closer look at where it comes from. Some of our more frequent readers will be familiar with the name SuperWeb. SuperWeb LLC belongs to the Sambreel/Yontoo group, a company that creates adware-type applications, such as Happy Cloud. It must be said that all of the applications are basically clones of each other. So Happy Cloud is almost identical to WebCake, Computer Pal, AlleyBrowse, and Giant Galaxy. So Happy Cloud’s main purpose is to display advertisements. But why does it do that? The answer is simple: The application’s developers get paid for promoting certain content. The program’s platform incorporates the pay-per-click system that calculates the number of clicks. If no one clicks the ads, the developers do not get paid. So they collect non-personal information about you to tailor the ads and make the advertising campaign more effective. It must be said that Happy Cloud is quite a versatile program and can generate all kinds of ads that include, but are not limited to coupons, banners, in-texts, search-related ads, video ads, and pop-ups. So the clients have plenty of advertising options to choose from. The reason why we recommend that you remove this program is because Happy Cloud is apt to promote misleading content which might get your PC infected with malicious software if you click the ads. So there you have it. This is all we have to say about Happy Cloud. We hope that the information provided was interesting and enlightening. Clearly, this program will only obstruct your browser sessions with unasked-for advertisements. There is no way of knowing what the ads may be hiding, so clicking them poses a significant risk that you should not expose your computer to. Do yourself a favor and remove Happy Cloud from your computer in a timely manner. 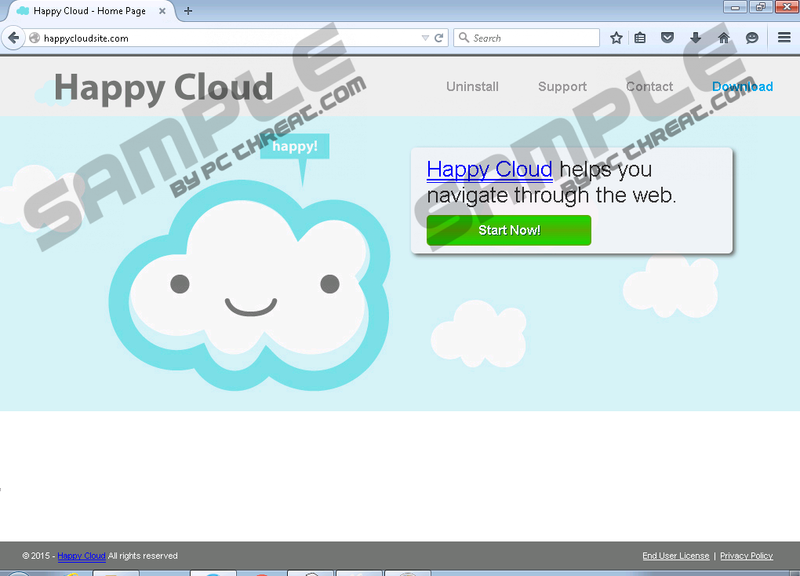 Locate Happy Cloud and click Uninstall. Locate Happy Cloud and click Remove. Quick & tested solution for Happy Cloud removal.